Ian D. Pavord et al.in two phase 3, randomized, placebo-controlled, double-blind, parallel-group trials found that Patients with chronic obstructive pulmonary disease (COPD) with an eosinophilic phenotype may benefit from treatment with mepolizumab, a monoclonal antibody directed against interleukin-5.The findings have been published in New England Journal of Medicine. The researchers through the trials compared mepolizumab (100 mg in METREX, 100 or 300 mg in METREO) with placebo, given as a subcutaneous injection every 4 weeks for 52 weeks in patients with COPD who had a history of moderate or severe exacerbations while taking inhaled glucocorticoid-based triple maintenance therapy. In METREX, unselected patients in the modified intention-to-treat population with an eosinophilic phenotype were stratified according to blood eosinophil count (≥150 per cubic millimeter at screening or ≥300 per cubic millimeter during the previous year). In METREO, all patients had a blood eosinophil count of at least 150 per cubic millimeter at screening or at least 300 per cubic millimeter during the previous year. The primary end point was the annual rate of moderate or severe exacerbations. Safety was also assessed. It was founnd that in METREX, the mean annual rate of moderate or severe exacerbations in the modified intention-to-treat population with an eosinophilic phenotype (462 patients) was 1.40 per year in the mepolizumab group versus 1.71 per year in the placebo group (rate ratio, 0.82; 95% confidence interval [CI], 0.68 to 0.98; adjusted P=0.04); no significant between-group differences were found in the overall modified intention-to-treat population (836 patients) (rate ratio, 0.98; 95% CI, 0.85 to 1.12; adjusted P>0.99). In METREO, the mean annual rate of moderate or severe exacerbations was 1.19 per year in the 100-mg mepolizumab group, 1.27 per year in the 300-mg mepolizumab group, and 1.49 per year in the placebo group. The rate ratios for exacerbations in the 100-mg and 300-mg mepolizumab groups versus the placebo group were 0.80 (95% CI, 0.65 to 0.98; adjusted P=0.07) and 0.86 (95% CI, 0.70 to 1.05; adjusted P=0.14), respectively. A greater effect of mepolizumab, as compared with placebo, on the annual rate of moderate or severe exacerbations was found among patients with higher blood eosinophil counts at screening. The safety profile of mepolizumab was similar to that of placebo. 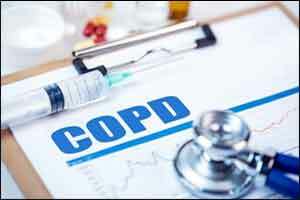 It was concluded that Mepolizumab at a dose of 100 mg was associated with a lower annual rate of moderate or severe exacerbations than placebo among patients with COPD and an eosinophilic phenotype. This finding suggests that eosinophilic airway inflammation contributes to COPD exacerbations.